This set of Molecular Biology Question Paper focuses on “Recombination in Higher Organisms – 2”. 1. What is the central protein of homologous recombination? Explanation: RecA is the central protein of homologous recombination. It is the founding member of a family of enzymes called the strand exchange protein. 2. What is the joint molecule? Explanation: The RecA bound three stranded structure is known as the joint molecule. It usually contains several hundred base pairs of hybrid DNA. 3. The RuvAB complex specifically recognizes the Holliday junction in a ATP dependent manner. Explanation: RuvA recognizes and binds to the Holliday junction and recruits RuvB protein to this site. RuvB is a hexameric ATPase thus making the process an ATP dependent one. 4. Which component cleaves the specific DNA strands at the Holliday junction? Explanation: RuvC recognizes the Holliday junction. It specifically nicks two of the homologous DNA strands that have the same polarity. 5. After cleaved by RuvC the resulting ligated recombination products will only be the splice product. Explanation: Depending on which pair of strands is cleaved by RuvC the resulting recombinant product will depend. It either forms a spliced product or a patched product. 6. What is the cleavage site of RuvC? Explanation: Cleavage by RuvC takes place at sites conforming to the consensus sequence 5’….A/TTTG/C….3’. cleavage occurs after the second T in this sequence. 7. What is the source of energy during the action of SPO11? Explanation: During the action of SPO11 the cleavage of DNA phosphodiester bond is stored in the bound protein-DNA linkage. By this process the DNA strands can be released. 8. What are the components of the MRX protein? Explanation: MRX enzyme complex is used for the event of DNA processing. It is composed of protein subunits, MreII, Rad50 and Xrs2. The first letters of the subunits gives the complex its name. 9. Processing of the DNA at the break site occurs at the 3’ end. Explanation: Processing of the DNA at the break site occurs exclusively at the 5’ terminus. The strand ic covalently attached to the Spo11 protein. 10. How many cycles are required for the configuration of chromosomes? Explanation: Chromosomes are configured during two division cycles. This is because meiosis involves two rounds of nuclear divisons. Explanation: The absence of recombination leads to the failed alignment of the chromosomes in the 1st meiotic division and as a result there is a high incidence of chromosome loss. This improper segregation of chromosomes is called nondisjunction. 12. For which biological phenomenon homologous recombination is critical? Explanation: Homologous recombination is critical for meiosis during the pachytene stage of meiosis I. This is important for the introduction of genetic variations in every generations. Explanation: Before cell division the cell has two copies of each chromosome, one of each was inherited from either parent. These are known as homologs. 14. What is the function of the Spo11 in meiotic recombination? Explanation: Spo11 gene encodes a protein that introduces DSBs in chromosomal DNA to initiate meiotic recombination. The Spo11 protein cuts the DNA at many chromosomal locations with little sequence selectivity but at a very specific time during meiosis. 15. How many subunits of Spo11 are involved in the process of cleavage of DNA? Explanation: The two subunits of Spo11 cleave the DNA two nucleotides apart on the two DNA strands. It makes staggered double strand break by cleavage. 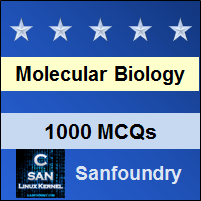 To practice all questions papers on Molecular Biology, here is complete set of 1000+ Multiple Choice Questions and Answers.